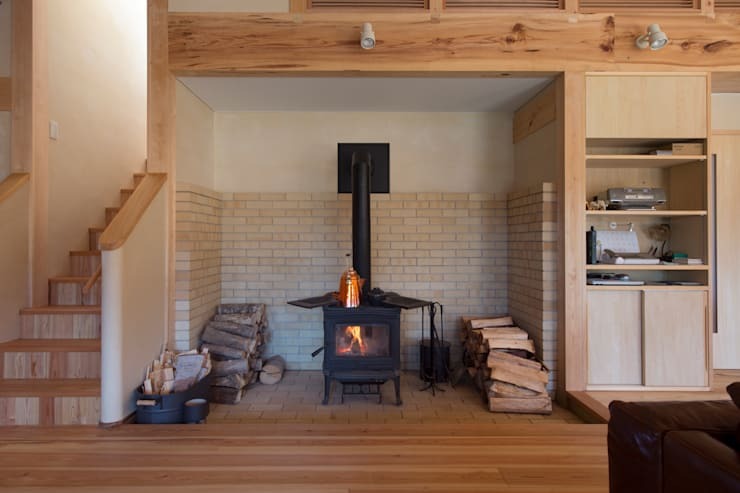 The timber home has a gently sloping peaked roof that sets a friendly, cosy ambience. The entrance is wide and the home has a large wraparound porch on one side. This combination of pale grey walls and honey coloured timber features is seen throughout the home. The aesthetic is bright, modern, airy and earthy at once. The home also has a two story mass designed with a standard geometry. The entrance we saw earlier, forms the wing we see on the left. This wing is the element that most interests us in the home. It doesn't run at a perfect 90 degree angle from the home. Instead, it branches outwards to create a skewed geometry that has been used to infuse the home with a special character. The meeting point between the two volumes in the home creates a lovely angled shape around the outside of the home. As we saw earlier, the home is located in a lovely mountainous locale, so the outdoor entertaining areas are an important part of the design. There is no direct parallel meeting point between the indoor and outdoor areas. Instead, there are two very distinct outdoor entertaining areas on both sides of the home. Each is angled to form a sort of embrace around the outdoor space. Inside, the unusual geometry creates lots of opportunity to explore the decorative elements of wood joinery. The wood joinery creates obvious interest. 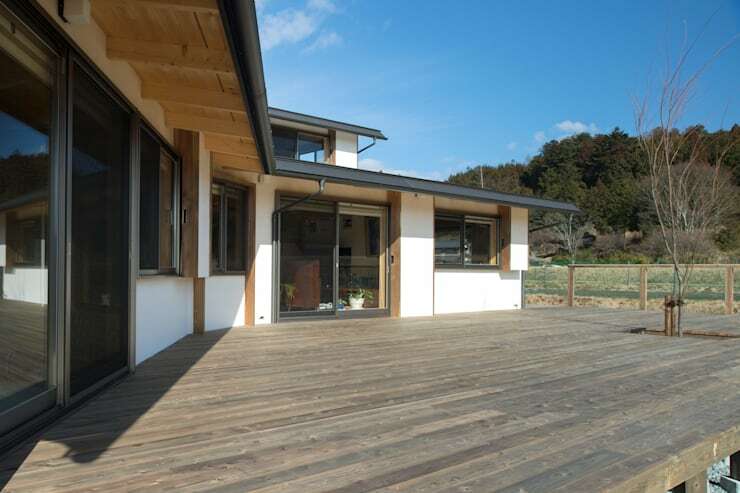 It allows the basic construction of the home to imbue the home with a distinctive appeal. This is certainly a home that needs no dressing up or fancy furnishing to look finished. On the second level of the home, we have some interesting wooden panels on the interior walls. 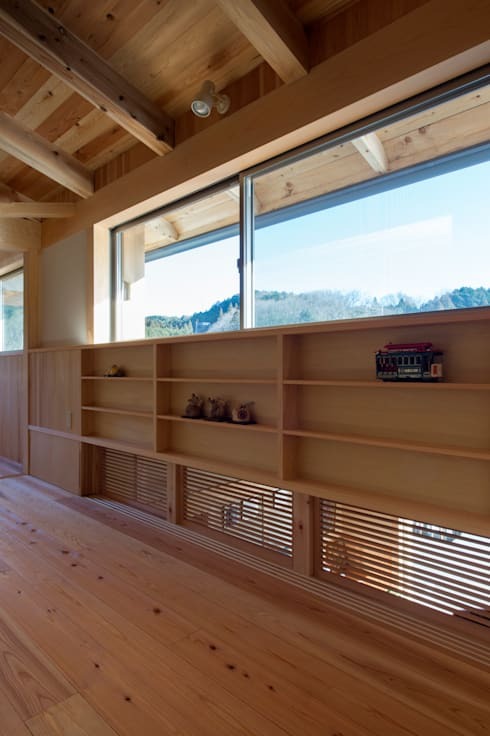 Like many Japanese homes, this house also has lots of built-in bookshelves. 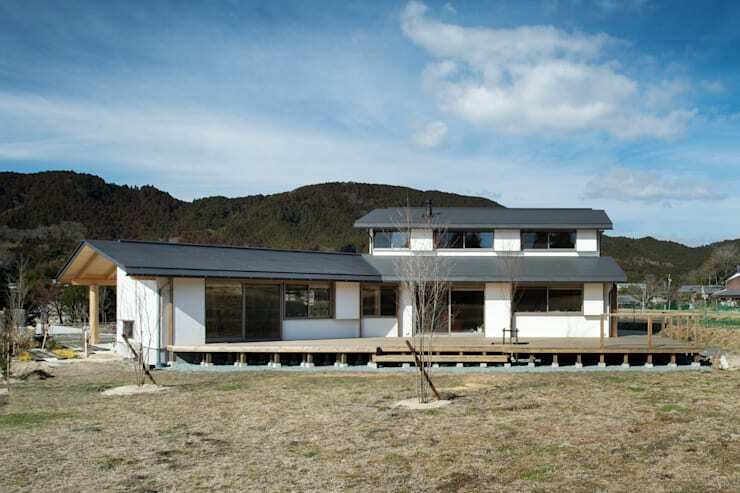 Note how the long panel windows have been used to carefully frame the mountainous views outside. 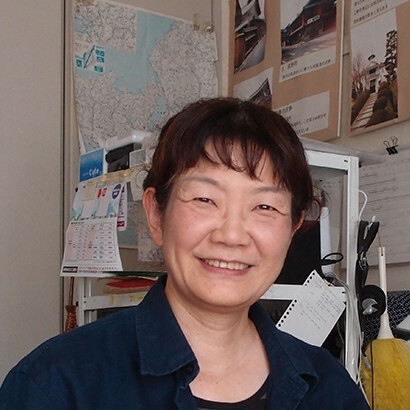 This is another common element seen in many traditional Japanese homes. In true rustic style, the architects have designed the home with a lavish fireplace. It has been set on a recessed brick floor within a special alcove. 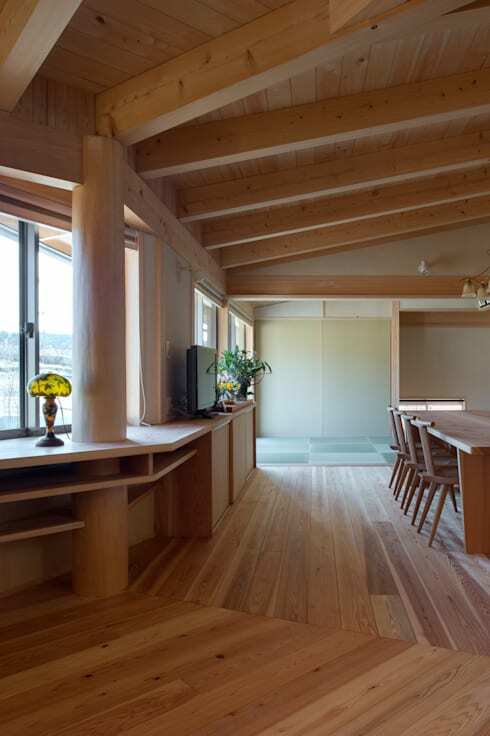 At this angle we also get a sense of the natural beauty within the home. 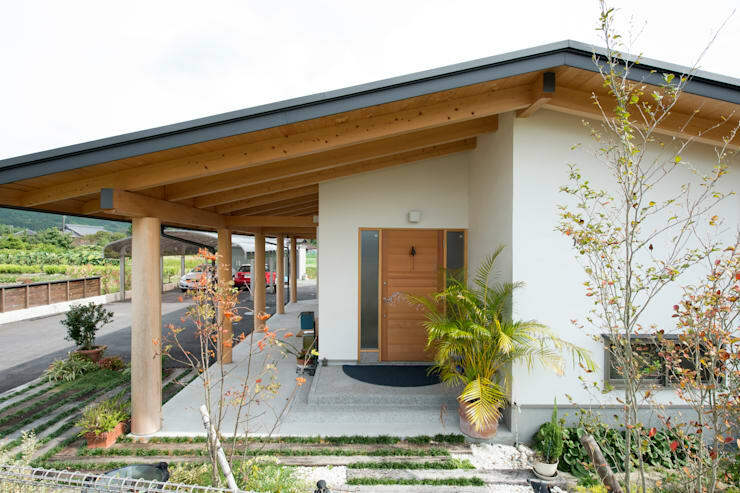 This is a home with a wing designed like the branch of a tree. So the natural materials really exemplify the spirit of the home. If you are in the mood for something different, have a look at Unique living! 6 low-budget stylish container houses. What do you think of the unusual layout of this design?